"Civil wars, revolutions, invasions and fascist dictatorships formed the political backdrop that defined the works produced in Madrid over the centuries." Miguel de Cervantes, Spain’s best-known writer, lived in the street that is now named Calle Lope de Vega in Madrid. In an ironic literary twist, playwright Lope de Vega, who was his arch-rival, resided in the next street, now called Calle Cervantes. The city they worked and died in was just a small town of 20,000 inhabitants until 1561 when King Felipe II ordered his entire court to relocate from nearby Toledo, reportedly because Madrid occupied a position almost exactly in the center of the Iberian Peninsula. Jules Stewart traces the city’s development over the past 458 years through the writers who lived and worked there and against the backdrop of the historical events that shaped them. Stewart walks us through Madrid’s streets, cafes, and literary salons, in the company of Cervantes, the author of Don Quixote, in the early 17th century; novelist and journalist Ernest Hemingway, and poet Federico Garcia Lorca in the 20th century; and lesser known figures such as “radical novelist and playwright” María del Valle-Inclán, a leading figure in Spain’s Generation of 1898 writers. Civil wars, revolutions, invasions, and fascist dictatorships formed the political backdrop that defined the works produced in Madrid over the centuries, often forcing their writers into exile, silence because of censorship, or, as in the case Lorca, into an early (still undiscovered) grave in his native Andalucia. These bite-sized literary portraits contain a mine of information that will send many readers browsing the Internet for more details and possibly leading them to blow their book budget for the month as they source the more intriguing titles. In extreme cases some might find themselves booking the next available flight to Madrid to sit at the table by the window favoured by Hemingway in Cervecería Alemana in Plaza Santa Ana, or El Café Gijón in Paseo de Recoletos where literary gatherings still take place. A map focusing on an area of Madrid known as Barrio de las Letras—Writers’ Area—where both Cervantes and Lope de Vega lived is a useful reference point for visitors who actually intend to use this book to navigate their way around the city. It also pinpoints many of the bars and cafes where Madrid’s writers congregated. On the downside, some of the pen portraits do not really match up to the stature of their subjects, particularly in the final section. Surely Javier Marías—probably Spain’s best-known, prolific and most widely read contemporary novelist—deserves more than just over a page? Stewart contends that Marías’ novels are not “about” Madrid, with the city serving merely as a backdrop. But then that is true of most novels set in any city. And geography and place does come to the fore in Marías' novels, particularly in Tomorrow in the Battle Think on Me and in the third novel of his sprawling Your Face Tomorrow trilogy. His decision to focus on a novel not translated into English by Antonio Muñoz Molina also appears to be slightly out of place. While his summary of Los misterioso de Madrid (the Mysteries of Madrid) certainly makes it sound worth reading, there is no mention of Muñoz Molina’s superb and widely acclaimed In the Night of Time, published in 2013, in which Madrid descends into chaos and societal breakdown as the Spanish Civil War grips. 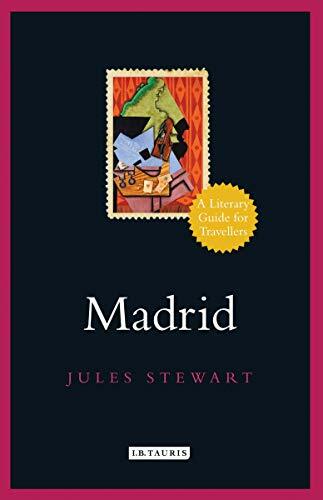 Quibbles aside, New York-born Stewart, who lived in Madrid for 20 years, does for the most part give a full and rewarding portrait of this city that he clearly knows intimately, paving the way for fellow explorers, both in the literal and literary sense. Tony Bailie is an Irish novelist, poet, journalist and travel writer. His novel A Verse to Murder is available as an ebook on Kindle. His previous two novels, ecopunks and The Lost Chord, are available as paperbacks. A new novel, Footnotes, is forthcoming. He has also had two collections of poems published: Coill and The Tranquillity of Stone.